I’ve grown to love the change of seasons in the northeast United States. Each year I find that I wait for spring blossoms and fall leaves. I’ve been here for fourteen years now, but this longing for the change in seasons keeps growing. I crave it more with every passing year: there is something so satisfying about the expectation of change and its clockwork regularity, along with that feeling of newness and excitement. So when I start seeing vivid orange pumpkins of assorted shapes and sizes sitting on a bench outside my neighborhood store in the fall, a deep thrill runs through me. 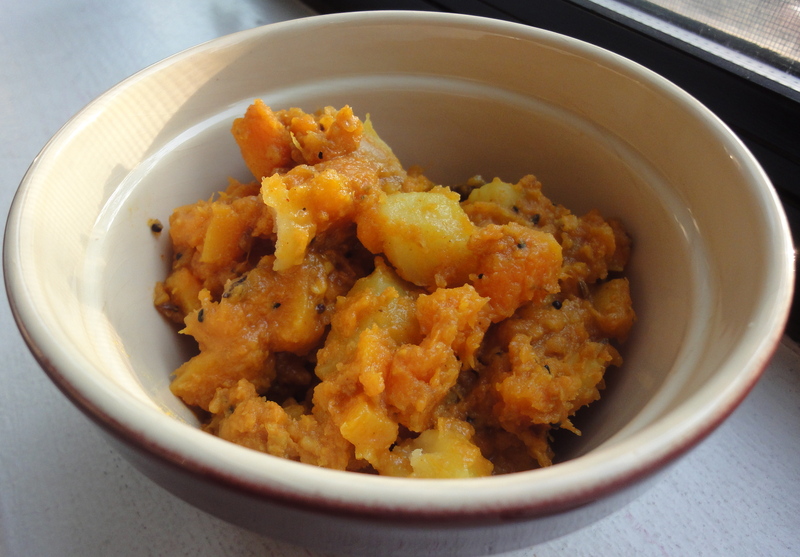 I think of the festival of Diwali in my Calcutta home, where a festive pumpkin dish, aloo kaddu, always makes an appearance. Year after year. The aloo kaddu is a humble and rustic preparation, but its presence in tiny silver bowls on a silver thali gives it an air of splendor. Piping hot and puffy urad-dal kachoris, crunchy boondis in cumin flavored yogurt and sweet milk-rice kheer complete the Diwali dinner offerings. I have always felt that this is the meal that we eat to celebrate where my family comes from. The earth on which the pumpkin grows, in the places that my great-grandparents once called home, such as Bikaner, Jaisalmer, Dehradun and Moradabad in Northern India. I’ve never been to most of these places, but the bite of chunky, sweet and spicy pumpkin and the heavenly aroma of cinnamon, clove and cardamom that fills my mouth permits me to taste what they must have eaten. And thereby, just for that moment, live the life that they must have led. This recipe makes use of panchphoran, which is a 5-spice mixture consisting of whole seeds of each of the following: nigella, fennel, fenugreek, black mustard and wild celery (radhuni). I often use butternut squash pieces instead of pumpkin. Amma, my paternal grandmother, also uses an unnamed thin-skinned winter squash that is orange on the inside and green on the outside without peeling the skin. It tastes delicious and the green-orange contrast looks gorgeous. I like to keep the proportion of pumpkin:potato about 3:1. The potato gathers all the flavors of the dish and creates a great base for the squares of melting pumpkin. My mother recently taught me to add pieces of Japanese or Italian eggplant to this dish. Now I frequently make a simple version with just eggplant, and with even fewer spices: no pieces of cinnamon, cardamom, cloves and no amchur. The fennel seeds in the panchphoran add a sweet and delicate flavor to the eggplant. 1. Heat oil in a medium pan and add Spices 1 for the tarka. Add ginger and green chillies and cook for a few seconds. Next add pumpkin and potatoes and roast for a few minutes. Add Spices 2 and cook for a few minutes; add salt. 2. Add about 2 cups water (vary based on how dry or moist you want the preparation); cover and cook until potatoes are cooked through. I would recommend not adding too much water. 3. Mash a few of the pumpkin pieces but leave potatoes whole. Add Spices 3 but keep garam masala for the very end. Cook for a few minutes and remove from flame.